Drexel student Michelle Silberman, founder and CCO (chief cookie officer) makes ChocAmo Cookie Cups, at Dorrance C. Hamilton Center for Culinary Enterprise, in Philadelphia, Wednesday, November 16, 2016. Michelle Silberman's business, ChocAmo Cookie Cups, was inspired by a childhood indulgence - cookies and milk. Her job title is chief cookie officer. But to assume her life is a dessert high is to misunderstand the rigors of starting a business - especially as a novice entrepreneur one year out of college, with no access to traditional capital and a need for funding to afford the kind of equipment to speed up production, and be able to expand distribution beyond Philadelphia and throughout the country within a year and a half. 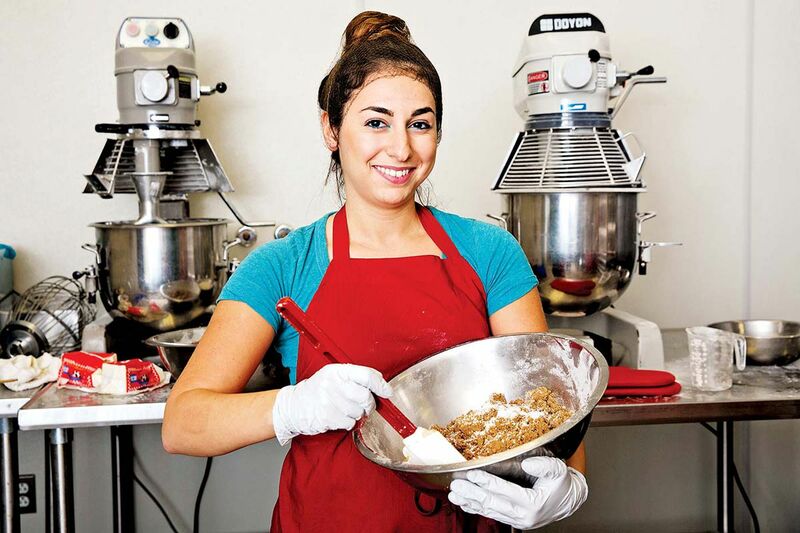 "Sometimes I have a down moment, and someone around me will believe in ChocAmo more than me," said Silberman, 24, after she added a few cups of chocolate chips to a bowl of just-mixed dough in a shared-kitchen facility in West Philadelphia. "It's a roller coaster. It's about putting your seat belt on every day." And it's about "teaching people what a cookie cup is," she said. Not that it's complex. It's what the name implies. The idea of making out of cookie dough a cup that could hold milk was one Silberman and her best friend in seventh grade joked about, she said. Fast forward to Silberman's freshman year at Drexel University, when she had to come up with a project for an entrepreneurship class taught by LeBow College of Business professor Christopher Finnin. "I thought she had a really cool product with wide-reaching commercial appeal and a great story to tell," Finnin said last week. He urged Silberman to test it. She did, trying a variety of doughs and burning more than a few batches before achieving a marketable product. "It was actually a fluke. We missed an ingredient, and it came out like this," Silberman said, next to a rack of freshly baked cookie cups cooling before they could be turned out of proprietary custom-made molds. She would not let photos be taken of them for this column or permit me to describe them. By the time Silberman graduated in June 2015, ChocAmo cups were satisfying sweets cravings at catered affairs and food festivals with cups filled with more than milk. Available in two sizes - minis holding just under one ounce of liquid; larger, 1.5 ounces - ChocAmo cups are marketed as ideal vessels for espresso shots, wine, even ice cream. Among the most popular are Mocha Dream - a chocolate chip cup lined with coffee-infused cream cheese frosting - and Birthday Cake, a sugar cookie cup with cream cheese icing and multicolor sprinkles. Those and others are available at www.chocamo.com, at the new Whole Foods at 22nd Street and Pennsylvania Avenue, and at Pinot Boutique in Old City. Cocktail-filled ChocAmo cups are on the menu for a reception Tuesday night for the new Jurassic World exhibit at the Franklin Institute. "We're always looking for something fun and creative to be able to do with food presentation," said Connie Rhynes, account executive for catering at Frog Commissary, the Franklin Institute's exclusive caterer. A recent partnership with Whole Foods in Philadelphia "shows there is an opportunity to scale regionally, then nationally," assuming the addition of more cost-effective production methods, said Damian Salas, assistant dean at Drexel's Charles D. Close School of Entrepreneurship. ChocAmo cups are handmade, a process that yields about 1,000 cups in eight hours. Through a Kickstarter campaign that ends Wednesday, Silberman hopes to raise $18,000 for equipment that could make 1,200 cookie cups in an hour. As of midday Nov. 22, $13,045 had been pledged from 226 backers. A production upgrade is essential because ChocAmo also wants to serve a vast wholesale market. It's not the first with this kind of product. Zia Valentina is a Los Angeles-based company, owned by sisters Naomi Kashi, 33, and Dorit Simone, 36, that started making Waffleshot cups in 2013 as "an eco-friendly way" to serve drinks featured in a cafe they operate. Their Waffleshot cups come in four sizes, holding a half-ounce to four ounces. Profitable, Zia Valentina is expecting sales of Waffleshots to exceed $1.5 million this year. They are available throughout the United States in cafes and wineries and at Neiman Marcus stores, as well as at www.thewaffleshot.com. Simone said there is room in the market for ChocAmo's cookie cups. "We believe people who do things that are authentic should be successful," she said. ChocAmo is a blend of the words chocolate and amour. "I'd really like the terms ChocAmo and cookie cup to be synonymous - the way Kleenex and tissue are," Silberman said. She's doing social-media consulting on the side until ChocAmo revenues can support a salary for her. For help with baking and sales, Silberman pays four to seven part-timers, including her brother, Brendan, a sophomore at Drexel. She expects ChocAmo to be profitable in nine months to a year.